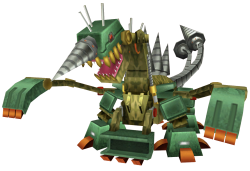 Brakedramon is a gigantic Machine Dragon Digimon said to exist in order to destroy everything on the ground. When it evolved it succeeded, through hacking, in obtaining the design data for various construction equipment, and it possesses power and ability surpassing other Machine Digimon. However, in exchange for excellent mechanical performance its organic parts were reduced almost to 0, and its motives and emotions were lost. For that reason, it does not falter from the damage its body suffers, and it is feared as the ultimate dragon of destruction that will continue destroying until it rusts away. Its "Destroyed Rush", which repeatedly strikes the earth at ultra high-speed with its left and right shovel arms, can split the solid ground, its "Infinity Boring", which fires all the drills operating throughout its body, can smash mountains, and its "Gravity Press", which raises its entire mass and then flattens the target, can crush everything. After Brakedramon passes, not even "What?" is left behind. This page was last modified on 14 March 2019, at 12:20.